Used mainly to make a temporary eye in a line. Commonly used in sailing small craft, for example to fasten a halyard to the head of a sail. The Federal Aviation Administration recommends the bowline knot for tying down light aircraft. Commonly referred to as the rescue knot because it can be tied around oneself one-handed, and is used to lift people out of dangerous situations. Used by climbers - though less popular now than it once was - see below. After the overhand knot and the figure-of-eight knot, the bowline is the next most useful and easy to learn knot. Many people are taught the slow and all thumbs 'Bunny' method. In fact it can be very fast to tie even under the most difficult of circumstances. The bowline, like the other 'loop on the end' knots, can be made and then secured over an object like a post. But unlike many other loop knots, the Bowline allows the working end to pass through a ring object before the knot is tied. This unique feature of the Bowline makes it a convenient loop knot and a knot that everyone should master. One bowline tied through another is one way of joining two ropes, although many other knots will preserve a greater share of the rope's initial strength. The bowline, or more commonly one of its variations such as the double bowline, is sometimes used by climbers to tie the end of the rope to a climbing harness, or the like. The advantage of the bowline in this application is that the knot is easy to untie even after it has been loaded. The disadvantage is that, while it is a very strong knot under load, it has a tendency to loosen up and become untied when it is unloaded and shaken around over a period of time, as might happen during a climb. John Smith's Seaman's Grammar (published in 1627) is perhaps the first written reference to it, although a "curiously intricate knot…akin to the bowline" was discovered on the rigging of Egyptian Pharaoh Cheops' solar ship during an excavation. 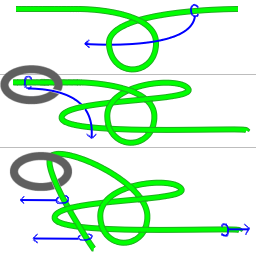 The structure of the bowline is identical to the sheet bend, but with one of the tails of the sheet bend connected to the running part of one of the lines. 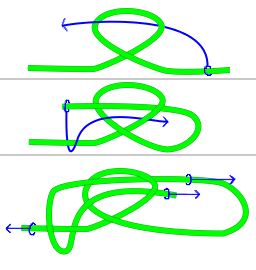 If you take a bowline, and cut the loop portion near the portion that does not have the tail beside it, you will have two lines joined by a sheet bend. Having such a strong basic knot as the sheet bend at its core, is consistent with the strength of this versatile knot. 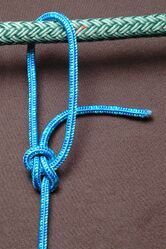 Template:Howto This knot can be tied in a number of ways, including in the air, around an object, and around oneself. The 'Bunny' method: form the hole (a loop), the bunny comes up through the hole, around the tree, and back down through the hole. This is considered a difficult method. Lightning (aka Jedi) method: Tie a slip knot with the main line as the adjustable end, pass the working end through the loop and pull the slip knot tight until it flips over (capsizes). The resulting knot is a bowline. Single hand method (aka Dragon): Grasp the free end with the thumb of the dominant hand (leaving some free length) and place the line behind the victim. Cross the free end over the line in front of the victim, then twist the hand under the line and up to form a loop around the wrist. Push the free end around the line, then slip the loop off the wrist. FAA Advisory Circular (AC) 20-35C, "Tiedown Sense." July 12, 1983. This page was last edited on 21 October 2016, at 00:03.